Interface to Satisfiability Modulo Theory (SMT) solvers. The purpose of an SMT solver is to determine if an expression is satisfiable. Solvers are reference counted objects that are allocated with instance static methods or create virtual constructors and should not be explicitly deleted. Definition at line 33 of file BinarySmtSolver.h. Reference counting pointer for SMT solvers. Definition at line 36 of file BinarySmtSolver.h. Definition at line 39 of file BinarySmtSolver.h. Maps expression nodes to term names. This map is populated for common subexpressions. Definition at line 57 of file BinarySmtSolver.h. Maps one symbolic expression to another. Definition at line 61 of file BinarySmtSolver.h. Definition at line 152 of file BinarySmtSolver.h. Free variables that have been defined. Definition at line 154 of file BinarySmtSolver.h. Bit flags to indicate the kind of solver interface. A runtime library is available. Definition at line 42 of file BinarySmtSolver.h. ROSE uses bit constants "#b1" and "#b0" (in SMT-LIB syntax) to represent Boolean true and false, but most solvers distinguish between bit vector and Boolean types and don't allow them to be mixed (e.g., "(and #b1 true)" is an error). Definition at line 54 of file BinarySmtSolver.h. Satisfiable and evidence of satisfiability may be available. Could not be proved satisfiable or unsatisfiable. Definition at line 78 of file BinarySmtSolver.h. Construct with name and linkage. Every solver should have a name that will appear in diagnostic messages, such as "z3", and a linkage mode that describes how ROSE communicates with the solver. The linkage mode is chosen as the least significant set bit of linkages, therefore the subclass should ensure that linkages contains only valid bits. If linkages is zero then the constructed object will be useless since it has no way to communicate with the solver. You can check for this situation by reading the linkage property, or just wait for one of the other methods to throw an SmtSolver::Exception. Definition at line 237 of file BinarySmtSolver.h. 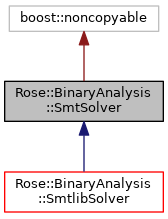 Implemented in Rose::BinaryAnalysis::Z3Solver, Rose::BinaryAnalysis::YicesSolver, and Rose::BinaryAnalysis::SmtlibSolver. Availability of all known solvers. Returns a map whose keys are the names of the SMT solver APIs and whose value is true if the solver is avilable or false if not available. Allocate a new solver by name. Create a new solver using one of the names returned by availability. The special name "" means no solver (return null) and "best" means return bestAvailable (which might also be null). It may be possible to create solvers by name that are not available, but attempting to use such a solver will fail loudly by calling requireLinkage. If an invalid name is supplied then an SmtSolver::Exception is thrown. Returns a new solver, an instance of the best available solver. If no solver is possible then returns null. Property: Name of solver for debugging. This name gets printed in various diagnostic messages. It's initialized to something reasonable by constructors, but can be changed at any time by the user. Definition at line 280 of file BinarySmtSolver.h. Definition at line 281 of file BinarySmtSolver.h. Property: How ROSE communicates with the solver. The linkage is set when the solver object is created, and is read-only. Definition at line 287 of file BinarySmtSolver.h. Referenced by Rose::BinaryAnalysis::SmtlibSolver::create(), Rose::BinaryAnalysis::YicesSolver::create(), and Rose::BinaryAnalysis::Z3Solver::create(). If the specified linkage is not available, then throw an exception. Given a bit vector of linkages, return the best one. "Best" is defined as that with the best performance, which is usually direct calls to the solver's API. If set, then perform memoization by caching all previous results. Definition at line 306 of file BinarySmtSolver.h. Definition at line 307 of file BinarySmtSolver.h. Id for latest memoized result, or zero. Definition at line 315 of file BinarySmtSolver.h. Definition at line 320 of file BinarySmtSolver.h. Definition at line 325 of file BinarySmtSolver.h. Determines if expressions are trivially satisfiable or unsatisfiable. If all expressions are known 1-bit values that are true, then this function returns SAT_YES. If any expression is a known 1-bit value that is false, then this function returns SAT_NO. Otherwise this function returns SAT_UNKNOWN. This is a high-level abstraction that resets this object state so it contains a single assertion set on its stack, and clears evidence of satisfiability. Determines if the specified expressions are all satisfiable, unsatisfiable, or unknown. This is a high-level abstraction that starts a new SMT solver session. For text-based interfaces, this solver object is reset, a temporary text file is created, the solver is run with the file as input, text output is read, and the evidence of satisfiability is parsed and stored in this object. Resets the solver to an initial state containing no assertions. The evidence of satisfiability is cleared. For API-based solvers, this function might also create a new solver and/or solver context. Reimplemented in Rose::BinaryAnalysis::Z3Solver, Rose::BinaryAnalysis::YicesSolver, and Rose::BinaryAnalysis::SmtlibSolver. Property: Throw an exception if the solver is reset. This is used mostly for debugging solvers that are intending to use transactions. If the solver is ever reset, say by accidentally invoking its satisfiable method, then an exception is thrown. Definition at line 373 of file BinarySmtSolver.h. Definition at line 376 of file BinarySmtSolver.h. Pushes a new, empty set of assertions onto the solver stack. Note that although text-based solvers (executables) accept push and pop methods, they have no effect on the speed of the solver because ROSE invokes the executable in batch mode. In this case the push and pop apply to the stack within this solver object in ROSE. Pops the top set of assertions from the solver stack. It is not legal to call pop when the assertion stack is only one level deep; use reset in that case instead. See also, push and reset. This is the number of sets of assertions. The push and pop increment and decrement this number. The return valued is always positive. Definition at line 404 of file BinarySmtSolver.h. Number of assertions at a specific backtracking level. Backtracking levels are numbered starting at zero up to one less than the value returned by nLevels. Total number of assertions across all backtracking levels. Inserts assertions into the set of assertions at the top of the backtracking stack. Returns the list of all assertions across all backtracking points. Assertions for a particular level. Returns the assertions associated with a particular level of the stack. Level zero is the oldest entry in the stack; all smt objects have a level zero. See also, nLevels. Check satisfiability of current stack. Checks whether all assertions in the entire stack of assertion sets are satisfiable. A set of no assertions is trivially satisfiable. Check whether the stack of assertions is trivially satisfiable. This function returns true if all assertions have already been simplified in ROSE to the single bit "1", and returns true if so; false otherwise. If no assertions are present, this function returns true. This function does not invoke any functions in the underlying SMT solver. Names of items for which satisfiability evidence exists. Returns a vector of strings (variable names or memory addresses) that can be passed to evidenceForName. Not all SMT solvers can return this information, in which case they return an empty vector. The returned names are only for those variables and addresses whose evidence of satisfiability can be parsed by ROSE. The subclasses provide additional methods for obtaining more detailed information. Reimplemented in Rose::BinaryAnalysis::YicesSolver, and Rose::BinaryAnalysis::SmtlibSolver. Definition at line 460 of file BinarySmtSolver.h. Evidence of satisfiability for a variable or memory address. If the string starts with the letter 'v' then variable evidence is returned, otherwise the string must be an address. Valid strings are those returned by the evidenceNames method; other strings result in a null return value. Subclasses might define additional methods for obtaining evidence of satisfiability. Definition at line 469 of file BinarySmtSolver.h. Evidence of satisfiability is cleared by calling this function or by calling any function that changes the state of the solver, such as pushing or popping assertion sets, inserting new assertions, or checking satisfiability. Checking satisfiability re-initializes the evidence. Evidence of satisfiability for a bitvector variable. If an expression is satisfiable, this function will return a value for the specified bitvector variable that satisfies the expression in conjunction with the other evidence. Not all SMT solvers can return this information. Returns the null pointer if no evidence is available for the variable. Definition at line 492 of file BinarySmtSolver.h. Definition at line 497 of file BinarySmtSolver.h. Evidence of satisfiability for a memory address. If an expression is satisfiable, this function will return a value for the specified memory address that satisfies the expression in conjunction with the other evidence. Not all SMT solvers can return this information. Returns the null pointer if no evidence is available for the memory address. Property: Statistics for this solver. The statistics are not reset by this call, but continue to accumulate. Definition at line 520 of file BinarySmtSolver.h. Property: Statistics across all solvers. The class statistics are updated whenever a solver is destroyed or its resetStatistics method is invoked. However, the nSolversCreated member is updated as soon as a solver is created. Resets statistics for this solver. Resets statistics for the class. Statistics are reset to initial values for the class as a whole. Resetting statistics for the class does not affect statistics of any particular SMT solver object. Check satisfiability using text files and an executable. Check satisfiability using a library API. Reimplemented in Rose::BinaryAnalysis::Z3Solver, and Rose::BinaryAnalysis::YicesSolver. Error message from running a solver executable. Given the solver exit status and (implicitly) the output of the solver, either return an error message or the empty string. This can be overridden by subclasses because some solvers exit with non-zero status if you try to get the model when (check-sat) returns not-satisfiable. Return all variables that need declarations. Definition at line 558 of file BinarySmtSolver.h. Print an S-Expr for debugging. A null pointer is printed as "nil" and an empty list is printed as "()" in order to distinguish the two cases. There should be no null pointers though in well-formed S-Exprs. Generates an input file for for the solver. Usually the input file will be SMT-LIB format, but subclasses might override this to generate some other kind of input. Throws Excecption if the solver does not support an operation that is necessary to determine the satisfiability. 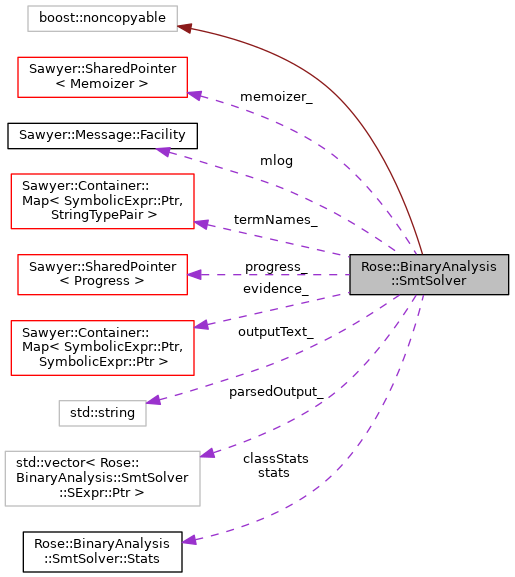 Implemented in Rose::BinaryAnalysis::YicesSolver, and Rose::BinaryAnalysis::SmtlibSolver. Given the name of a configuration file, return the command that is needed to run the solver. The first line of stdout emitted by the solver should be the word "sat" or "unsat". Parse all SExprs from the specified string. Some solvers can emit information about what variable bindings satisfy the expression. This information is parsed by this function and added to a mapping of variable to value. Definition at line 580 of file BinarySmtSolver.h. Normalize expressions by renaming variables. This is used during memoization to rename all the variables. It performs a depth-first search and renames each variable it encounters. The variables are renumbered starting at zero. The return value is a vector new new expressions, some of which may be the unmodified original expressions if there were no variables. The index is also a return value which indicates how original variables were mapped to new variables. Undo the normalizations that were performed earlier. Each of the specified expressions are rewritten by undoing the variable renaming that was done by normalizeVariables. The index is the same index as returned by normalizeVariables, although the input expressions need not be those same expressions. For each input expression, the expression is rewritten by substituting the inverse of the index. That is, a depth first search is performed on the expression and if the subexpression matches a value of the index, then it's replaced by the corresponding key. Called when the ROSE library is initialized. Additional output obtained by satisfiable(). Definition at line 187 of file BinarySmtSolver.h. Definition at line 202 of file BinarySmtSolver.h.